Not sure I’ve posted a recipe without a photo. But I am tonight, because I don’t have time to make the dish and take a photo. Plus, I wanted to get it posted before Thanksgiving. Ok, so there isn’t a lot of time to make this in time for Thanksgiving, but it is quick. And you might be making a pumpkin pie anyway, you could have leftover bread, so you might have all the ingredients already. And maybe you feel like trying something new. This Pumpkin Bread Pudding is a nice alternative to a traditional pumpkin pie. It combines the best of two worlds–pumpkin pie and bread pudding! It’s not just for Thanksgiving time; you can make it year round. I keep a bag of bread cubes in the freezer. If we have an extra chunk of bread, it goes in the bag. When I get enough, then I make it. Hope you have a wonderful and safe Thanksgiving. Many thanks to all of you. Optional toppings: whipped cream, warm dulce de leche or caramel sauce, whiskey sauce, and/or a sprinkle of pecans. Preheat the oven to 350°. Melt the butter in an 11×17 baking dish. Swirl it around to coat the bottom and sides. This is a lot of butter, but you will later pour the excess into the pumpkin mixture. Tear or cut the bread into medium pieces and place in a large mixing bowl. Sprinkle the bread with ⅓ cup of sugar, toss it around, and let it sit while you prepare the pumpkin mixture. In a separate bowl, lightly beat the eggs. Add 1 cup sugar, half-and-half, pumpkin, excess butter, salt, spices, and vanilla. Mix well. Pour the pumpkin mixture over the bread and stir. Place half in the baking dish, sprinkle with raisins and pecans. Top with remaining mixture. Top with the other half of the mixture. Bake for 25-35 minutes or until firm and lightly brown. Serve warm with one of the toppings or enjoy it plain! Fall is my favorite season. I love most everything about it (except for fall allergies). I especially love cooking in the fall – soups, stews, breads, most anything with butternut squash, pumpkin, sweet potatoes, and apples. This is another short post, wanted to share some of my favorite sweet treats that I make in the fall. I know Halloween is in a few days, but these recipes are quick and easy (well, the first two are). Maybe there’s enough time for you to try them for a fall festival, cakewalk, Halloween party, or bake sale. They are also delicious throughout the year. My friend DeeDee first told me about this cake. Those who know me know that I can’t leave well enough alone and had to tinker with her recipe. It is still a work in progress and feedback is appreciated. This is perfect when you need a last minute dessert. It can be made as a sheet cake, frosted with cream cheese frosting or served plain. You can also bake in loaf pans (then you can eat it for breakfast, because it’s just like bread!). You can add nuts, dried fruit, or keep it plain and simple. 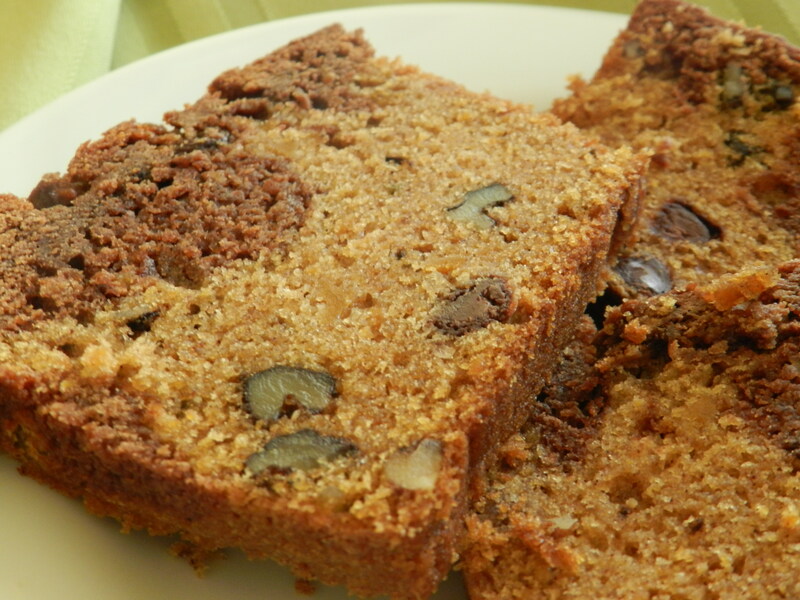 The most difficult part of this recipe is finding the spice cake mix at the grocery store! When I find it, I buy a few to keep in the pantry for last minute baking. 1. Preheat the oven to 350 degrees F. Generously grease a 9×13 inch baking pan (or you can make cupcakes/muffins or small loaves). 2. In a large bowl, mix together the spice cake mix, pumpkin, eggs, water, butter, and spices until well blended. 3. Spread evenly into the prepared pan(s). Bake for 25 to 30 minutes in the preheated oven, or until a tester inserted into the center comes out clean. Cool. Frost with cream cheese frosting if you want or you can serve it as is. Store leftovers in the refrigerator. Tastes even better the next day. This is an adaptation of one of my favorite Thanksgiving desserts – Pumpkin Cheesecake with a Chocolate Ganache Swirl. This is a mini version using Oreo cookies for the crust and omitting the chocolate swirl. 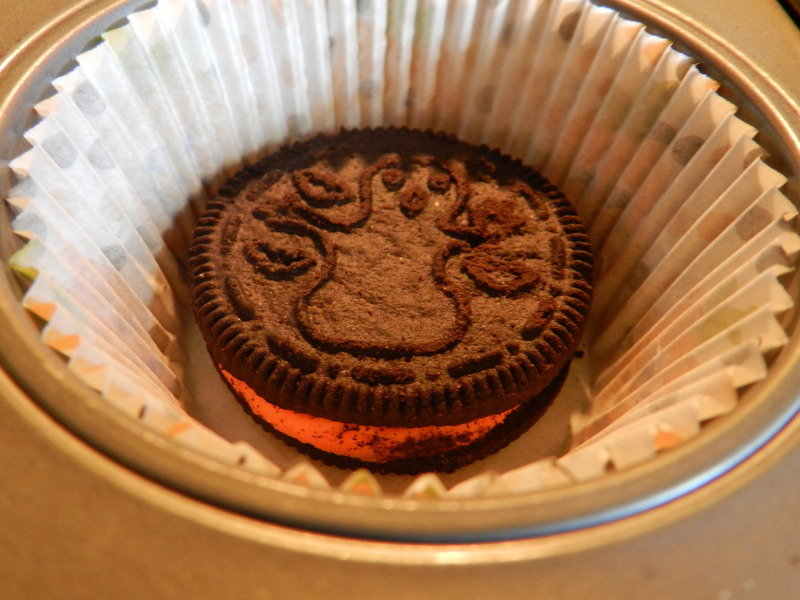 We are going to a Halloween party this weekend and were asked to bring something “festive.” Hope the bright orange Halloween Oreos and jack-o’-lantern cupcake liners make these festive enough. Guess if I wanted to be really festive, I could decorate them with candy corn, candy pumpkins, or a spider web with a candy spider. Yeah, probably won’t happen. 1. Preheat oven to 300 degrees. 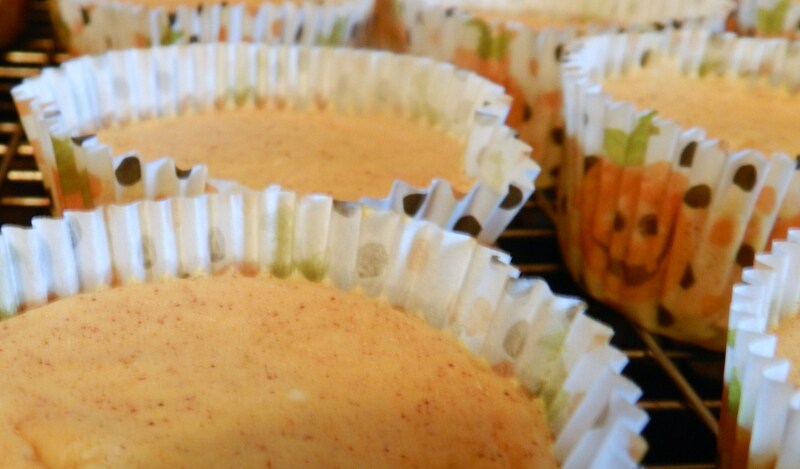 Line muffin pans with cupcake liners. This recipe makes between 24 and 30 mini cheesecakes. 2. Place a cookie in the bottom of each cup. 3. Beat the cream cheese and sugar at medium speed with electric mixer. Scrape the bowl frequently and beat until smooth. 4. Add the pumpkin and spices and beat until smooth. 5. Add one egg, beat until well blended and then add the second egg. Beat until smooth. 6. Fill cups with pumpkin cheesecake mixture. 7. Bake approximately 20 minutes or until centers are just set. Cool completely on racks and then refrigerate overnight. *NOTE: After baking these and testing them, I realized the Oreo is too much cookie for my taste. So, next time, I will experiment with thin Nabisco Famous Chocolate Wafers. This is the cookie I use to make the crust of the full-size cheesecake. They are like the chocolate cookie of the Oreo, without the filling. However, Nabisco Famous Chocolate Wafers can be tricky to find in grocery stores, kind of like spice cake mix. Often, they are located near ice cream toppings. Another option is to split the Oreo and just use one half of the cookie for the crust. The original recipe was given to my Mom and Dad by a nice, elderly woman on Monte Sano Mountain. Wish I could remember her name, very sweet woman. She originally got the recipe from Victory Garden in the late 1980’s. I’ve made a few changes to it, but still have her original recipe…it is well-worn and much-loved! 1. Preheat the oven to 350 degrees F. Beat sweet potatoes, oil, eggs, vanilla, and sugar in a large mixing bowl. 2. Sift the flour, baking soda, baking powder, salt, and spices in a separate bowl. 3. Add the sifted dry ingredients to the wet ingredients and beat on low-speed until blended. 4. Fold in chocolate chips and chopped walnuts. 5. Pour about 1/3 of the cake batter into a separate bowl (for less clean up, use the bowl from sifting the dry ingredients). Add the cooled, melted chocolate. Mix until blended. 6. Grease and flour a large tube pan. If you don’t have a tube pan (maybe because it was bent in a move, not like that’s happened to me or anything), you can use a bundt pan and then use the extra batter for a small cake, mini loaves, or muffins. 7. Place the batters into the pan(s), alternating between the two types. I typically use a measuring cup to place dollops of batter. Use a knife or wooden spoon handle to swirl the two batters, making a marbleized effect. Last time I made this, I skimped on this step and just poured the plain batter in the bottom of the pan and dolloped the chocolate batter on top. I swirled it, but it was not swirled enough, so instead of a marbleized, swirly look, I got a two-tone look. Not quite as pretty, but still tasty. 8. Bake for about 70 minutes (for the tube pan) or until a toothpick comes out clean.